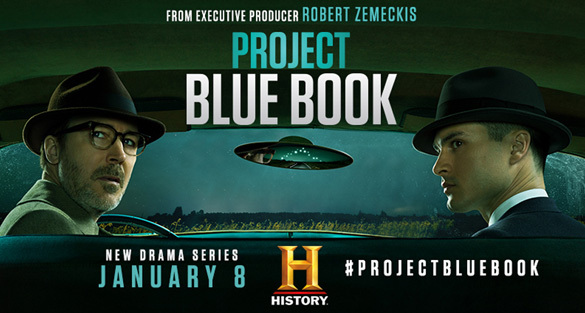 The new History Channel series Project Blue Book will debut on January 8 at 10 PM. Based on the true, Top Secret investigations into Unidentified Flying Objects and related phenomena conducted by the United States Air Force from 1952-1969, the series follows the personal experiences of Dr. J. Allen Hynek (Aidan Gillen from Game of Thrones), a brilliant college professor recruited by the U.S. Air Force to spearhead this clandestine operation that researched thousands of cases, over 700 of which remain unsolved to this day. Each episode will draw from the actual case files blending UFO theories with authentic historical events from one of the most mysterious eras in United States history. The series also stars Michael Malarkey (The Vampire Diaries).